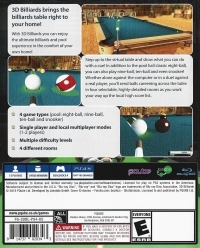 Box Text: 3D Billiards brings the billiards table right to your home! With 3D Billiards you can enjoy the ultimate billiards and pool experience in the comfort of your own home! Step up to the virtual table and show what you can do with a cue! In addition to the pool hall classic eight-ball, you can also play nine-ball, ten-ball and even snooker! Whether alone against the computer or in a duel against a real player, you'll send balls careening across the table in four selectable, highly-detailed rooms as you work your way up the local high score list. 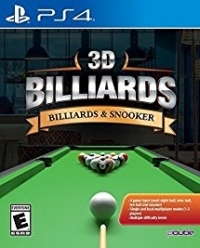 This is a list of VGCollect users who have 3D Billiards: Billards & Snooker in their Collection. 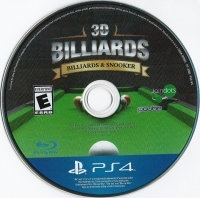 This is a list of VGCollect users who have 3D Billiards: Billards & Snooker in their Sell List. This is a list of VGCollect users who have 3D Billiards: Billards & Snooker in their Wish List.